When the whole Greek yogurt craze started a few years ago I quickly joined in. I always loved yogurt and was so curious about this new yogurt. I tried it and liked it but only bought it when I could find a good sale. Why buy the Greek kind if I could get the regular kind for less than a dollar? The answer is Protein! Greek yogurt has so much more protein than the regular kind. I never really was one to load up on Protein. I know now how full it keeps you. Since eating my Greek yogurt I always feel full after snack time. 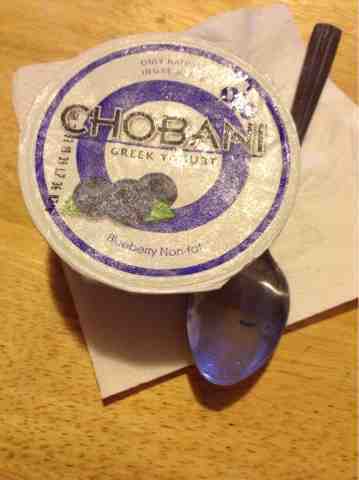 I can eat my Chobani for snack and feel satisfied until my next meal. In my opinion Chobani is the best tasting and creamiest yogurt. Best thing is a I got a case of it at Costco where each yogurt comes out to less than a dollar! What is your favorite kind of Greek yogurt? My husband and I switched over to greek yogurt a year ago. We love it! Fills us up so much longer! I am a friend from the BlahBlahBloggie group.